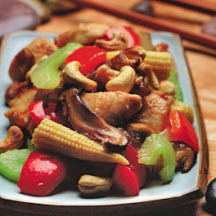 This classic Cantonese stir-fry traditionally uses cashews that are deep fried. A healthier approach is to oven roast the nuts which brings out more flavor of the cashews. Young ginger is available mostly in the spring and summer and is more tender and milder in flavor than the regular ginger that is found year round. Young ginger is pale yellow and does not require peeling and has pink-tipped shoots. If you find young ginger, reduce the amount by half. In a medium bowl, rehydrate the mushrooms in 1/3 cup warm water for 20 to 30 minutes or until softened. Drain and squeeze out water, reserving the soaking liquid. Cut off woody stems and thinly slice caps. Cut the chicken into 1-inch cubes. In a medium bowl, combine the chicken, 2 tablespoons of soy sauce, rice wine or sherry, cornstarch, sugar and salt. Mix well to combine and set aside. Place the cashews on a baking sheet and bake for 7 to 10 minutes, or until golden brown. Remove and set aside to cool. Heat a 14-inch flat bottomed wok or skillet over high heat until hot but not smoking. Add 2 tablespoons canola oil and half of the ginger and stir-fry for 30 seconds. Add the marinated chicken, spreading it on the wok keeping undisturbed for a couple minutes or until chicken starts to brown. Then, use a metal spatula to stir-fry for an additional 1 to 2 minutes, or until the chicken is browned on all sides, but not cooked through. Transfer chicken to a warmed plate and set aside. Replace wok to the stove and heat over high heat. Add remaining canola oil to the wok and then add the remaining ginger, garlic, onion, celery, red peppers, corn and mushrooms. Stir-fry for 1 minute. Add reserved mushroom liquid and stir-fry till almost all the liquid has evaporated, about another minute. Return the chicken to the wok with any collected juices, with the cashews and remaining soy sauce; stir fry 1 to 2 minutes, or until chicken is cooked through. Transfer to a warm serving platter. Nutritional Information Per Serving (1/6 of recipe): Calories 350; Total Fat 19g; Saturated Fat3g; Cholesterol 70mg; Sodium 730mg; Carbohydrates 16g; Fiber 2g; Protein 30g.